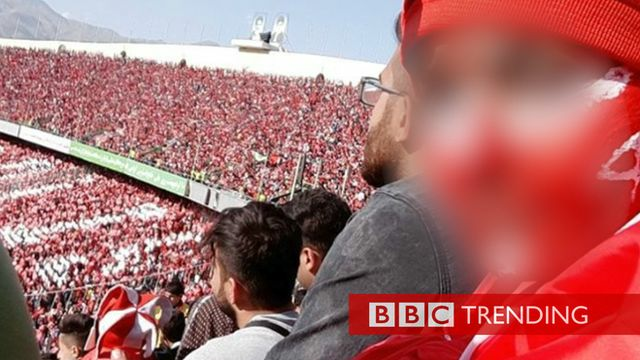 Woman dons male disguise to get into Iranian soccer stadium Jump to media player An Iranian woman, disguised as a man, snuck into a Tehran football stadium to watch her favourite team. Ever heard an Iranian mother-in-law joke? Jump to media player Why young Iranians are flocking to Instagram for their comedy fix. Not Your Asian Sidekick Jump to media player #BBCtrending: Not Your Asian Sidekick. The story behind the trend. How the Iranian internet lit up with euphoria after deal Jump to media player As news spread of a nuclear deal between Iran and world powers, there came a huge reaction online. The mouse messiah bringing salvation to India's atheists Jump to media player They worship a cartoon mouse who wears a superhero costume, but devotees of India's Dinkoist movement have a serious message. The marble racing craze that's captivated the internet Jump to media player Millions of people are watching marbles race through intricate custom made tracks online. An Iranian woman managed to sneak into a football stadium in Tehran by dressing up as a man. She filmed the experience and shared it on social media where the video has divided opinion. Although there's no official ban on women going to sporting events in Iran, it is rare for them to attend as they're often refused entry. Video editor: Nathan Carr. Producer: Emma Wilson. Camera: Anne-Marie Tomchak. Go to next video: Ever heard an Iranian mother-in-law joke?